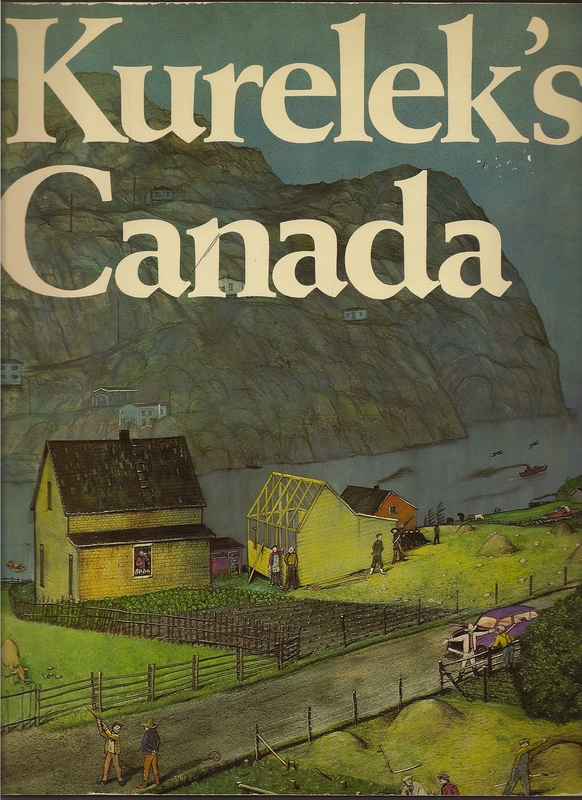 This week, in the local used books establishment, I found a real treasure: Kurelek’s Canada (Pagurian Press, 1978), which is no longer in print. It contains more than 30 reproductions in colour, as well as some in black and white, of the paintings of William Kurelek (1927-1977), and also his writing about them. And all this for only a dollar! I’ve liked Kurelek’s work ever since I first encountered it, through A Prairie Boy’s Winter (1973) and A Prairie Boy’s Summer (1975), and then his wonderful A Northern Nativity, which pictures the holy family in a variety of ethnic and geographic settings — from a fisherman’s hut to an Amish Mennonite buggy to a boxcar to a soup kitchen. For many years, until they became just too faded, we had four framed calendar prints of some of the prairie scenes hanging on one of our walls. Kurelek had an unhappy childhood in many ways and a complex relationship with his father — both hating and worshipping him, he said later. He was the oldest of seven children of a hardworking prairie couple (Alberta and Manitoba), his parents of Ukrainian immigrant origin. He was painfully shy, sensitive, artistic, but inept at those mechanical and physical things that might have earned his parents’ praise. So powerful was his desire to do art, however, that he risked their disapproval to study it. Kurelek’s sensitivity to this country’s landscapes and history, and his sensitivity to the pleasures and dreaminess of being young, have always resonated with me. It’s as if his memories are my memories too, no matter how different the details. But in studying and enjoying my “new” book this week, I find this artist is giving me something else. He’s giving me memories of my father. What do I mean? Well, it occurred to me that the specific references in so many of these works belong to Kurelek’s generation, which of course, is my father’s generation as well. That’s obvious enough, but I never thought of this before, because I didn’t need to, I suppose, just delighting in them for my own reasons. Now, however, my dad (88) has Alzheimer’s disease and is so very gone from us already, and in the last weeks declining even further. I took the Kurelek book along when I went over to see him yesterday afternoon. He was in bed, mostly sleeping. When he opened his eyes, I showed him “Skating on Spring Run-Off.” He looked at it but he didn’t seem to see it. Has this ever happened to you, a familiar story or beloved artist’s work suddenly meaning something else for you altogether? This entry was posted in Art, Books, Personal and tagged Alzheimer's, joy, Kurelek, Kurelek's Canada, prairie landscape by doradueck. Bookmark the permalink. 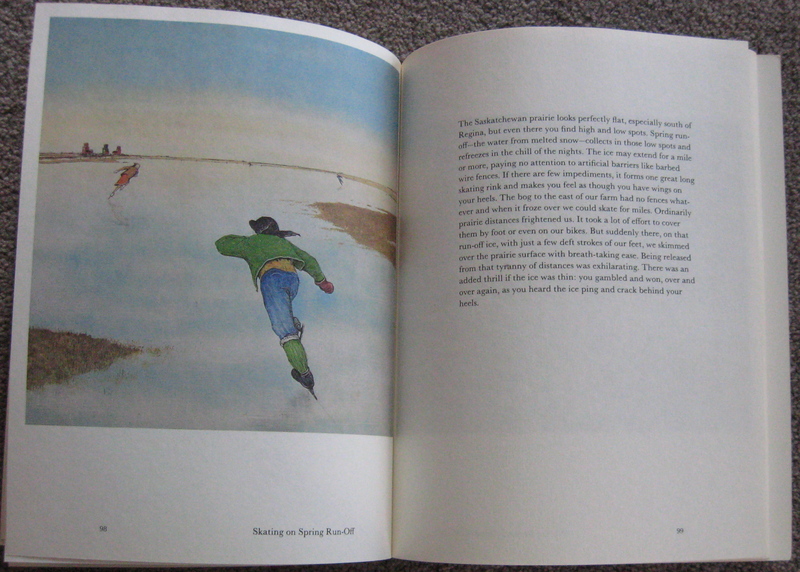 I adore Kurelek’s work – also, falling in love with the Prairie Boy set (that I bought for a dollar or so each!). I can totally relate to the starkness (being from a teeny town in upstate NY) and find myself almost transported, every winter and summer when I look through each book again, back to the home I miss. Oh, how I’d love to have a huge print to hang on my wall. Good to hear from another fan, Denise! I would love to get a copy of these books. I grew up upstate New York.